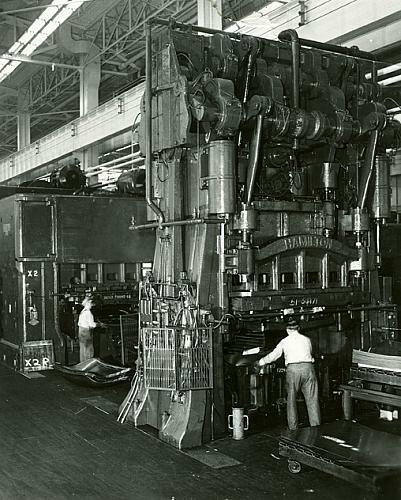 An employee of the Grand Rapids Metal Stamping Plant, standing in front of one of the huge presses, gives scale to the size of one the these machines. The name Hamilton on the press indicates its manufacturer. A stack of parts already shaped can be seen on the floor at the left, next to another employee. Reproduction and copyright information regarding this image is available from the Wyoming, MI Historical Commission.